The National Wilding Conifer Control Programme has achieved some impressive progress over its first year and a half, and is continuing at pace. The high regard in which the Programme is widely held is a tribute to the efforts of everyone involved. While this is a busy time in the wilding conifer control calendar, it is good to pause briefly and reflect with satisfaction on how much we have collectively achieved in such a short time. In our first year, the Programme has seen conifer spread successfully checked in some of New Zealand’s most iconic landscapes, conservation areas, high-country farms and important water catchments. Much of the 1.2 million ha treated in Year 1 was in the relatively early stages of being invaded, so this work was very much a ‘stich in time saves nine’. Of the 14 areas covered by the Programme in Year 1, eight have now had most of their problematic seed sources removed and conifer spread halted. 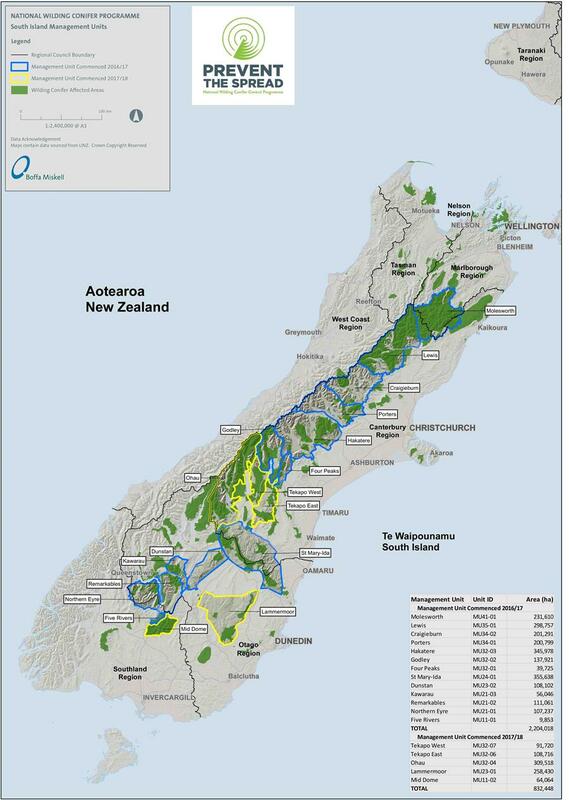 This has protected vast tracts of land, including High Country farmland and conservation land, in the Lewis, Cragieburn, Porter, Godley, Four Peaks, St Mary-Ida and Dunstan areas, as well as in the Kaimanawa area of the North Island. Follow-up control work in these areas is planned for three years’ time. Funding agreements with all 5 regions in the national wilding conifer programme have now been signed off, and control operations – both ground and aerial – are well underway in this 2017/18 season. Both the Operational and the Technical Advisory Group have now signed off on a national process for assessing, developing and agreeing on good practice in wilding pine control. The first good practice area which will be put through this system is Aerial Basal Bark Application of herbicide. The new Wilding Conifer Information System (WCIS) was launched in July this year, and a series of training workshops have been held around the country to roll out the system - which will provide up to date information on the national situation and support improved planning and reporting for the Programme. In January 2018, operational reporting across all Management Units will switch over to the new system. Two interns are currently engaged by LINZ to work with partners and help migrate existing data into the WCIS. LINZ were recently recognised at this year’s Spatial Excellence Awards for the WCIS – picking up the top prize in the Environment and Sustainability Category. Congratulations, LINZ! The Programme needs a simple conifer ID guide to help field teams record the wilding conifer species present and their density. We’re aware of several groups already working on such a guide, and have begun to talk with these and others – towards developing a field guide for the Programme in the New Year. We’re in the process of redeveloping the wildingconifers website. Content has been drafted and passed by a website management team of representatives from MPI, DOC, LINZ, Regional Councils, Researchers, and NZWCMG. Their comments have been included and material is now being uploaded to a development site. We aim to have this available for partner and stakeholder feedback in January. Highway and layby area signs will be in place near some visible control areas over summer (Molesworth Station, Arthur’s Pass, Mackenzie Country (Twizel/Mt Cook/Omarama), Alexandra, and Mid-Dome). Backcountry huts will get some attention too – with DOC and helicopter operators distributing notices to huts that describe the work underway and what backcountry users can do (contact DOC) if they come across wilding conifers. We have developed some guidance to help land holders understand when they can clear tree weeds without incurring a financial liability under the Emission Trading Scheme (ETS). 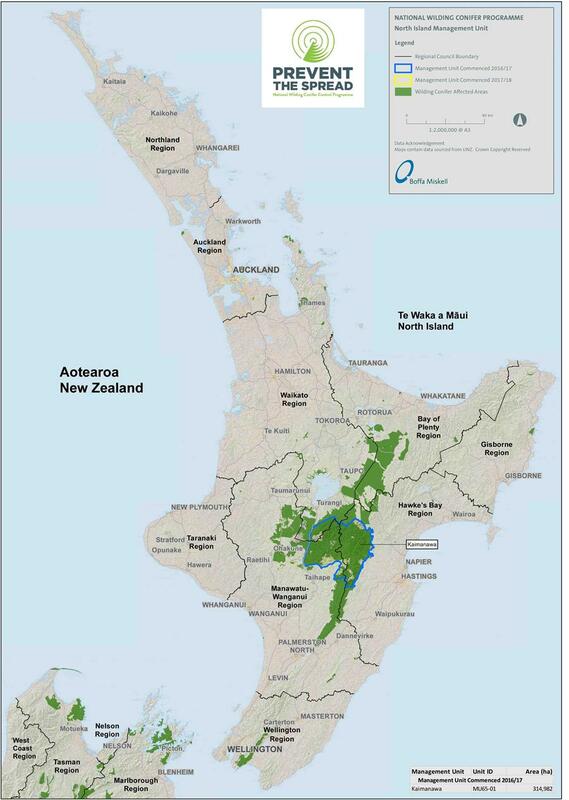 This four-page booklet (‘Managing tree weeds and the Emissions Trading Scheme’) is available here on the MPI website.